Thaddeus M. Niles, Skidmore College, Saratoga Springs, New York, USA. Niles, T. M. (2013). Announcing the ESL-WOW for self-directed writing support. Studies in Self-Access Learning Journal, 4(1), 56-61. ESL-WOW (Writing Online Workshop), a new online resource for students aiming to develop academic writing skills, has been available to the public at no charge since December 2012. Students can visit www.esl-wow.org to learn more about the academic conventions that confound new entrants into academic discourse communities, or to learn more about what makes writing clear and cogent in general. While the site is designed for adult learners and students entering community colleges, a wide variety of intermediate and advanced learners can certainly benefit from the materials offered by the ESL-WOW. A team from a private college in New York along with an advisory committee of researchers and writing directors from other universities and community colleges developed the ESL-WOW. A professional graphic design concept and attractive videos enrich what is a standard pre-college writing curriculum, hopefully engaging self-directed learners more than a text-only web resource. Development costs were supported by a grant from the U.S. Department of Education, and the developing college will continue to host the web site so that students from around the world can connect to academic writing resources free of charge. Visit www.esl-wow.org/additional/about.html for more details. As part of the development and testing phase, the program was included in online courses at a large community college in California, a private college in New York, and a “flipped” writing classroom at another private college in New York, where students learned content at home before practicing or discussing what they learned together in a physical classroom. Besides the important evaluative feedback that these trial runs have provided, students may take heart in knowing that their self-directed instruction program is included in various college curricula. “Flipped” classrooms, a topic that is enjoying somewhat of a surge these days (e.g., Watters, 2012), can be thought of as a course divided between two environments: a self-directed learning environment (i.e. the student’s home) and a traditional classroom environment where teachers and peers can provide clarification and feedback. At home, students learn content that used to be covered in lectures, and they return to the classroom to apply what they’ve learned (something that used to be homework) or ask questions. It is important to note that while this ESL-WOW course has had trial runs under “flipped” conditions, as well as in online classrooms, it was designed to be a free resource for students to access anywhere in the world. Thus, while it is certainly advantageous to have a writing instructor or roomful of peers with which to confer, this course always targeted self-directed learners working towards academic membership or at least academic literacy. Mastering the conventions of academic writing would seem to require both reflection and action, both knowledge and practice. Without feedback from an instructor, there is a question of whether the practice component would be worthwhile for self-directed learners (Myles, 2002). I make no great claims that the ESL-WOW can take the place of a qualified instructor and a community of reflective learners; however, I am prepared to assert that this tool makes a real contribution to the world of online writing instruction. The course focuses on grammar and rhetorical conventions (such as topic sentences, thesis statements, and employing evidence) with the understanding that students approach academic writing from different perspectives. Rhetorical awareness, as a prerequisite to intercultural communication, can help a self-directed student express themselves in academic or professional contexts and ultimately prepare future him or her to enter a Western academic culture that exhibits unique (if not quirky) composition practices (Spack, 1997). Beyond this, even those students who have no plans to enter a Western university can benefit from carefully examining their own writing practices and considering strategies that might lead to greater clarity or efficiency as they move from ideas to a finished product. In short, sparking students to think about their own writing would seem to be at the core of any program of instruction, be it in a classroom or as a self-directed online course. The online program divides instruction into modules based on a process-centered approach to writing, beginning with the invention phase, then continuing to the drafting, revising, and editing phases. Each module includes a series of pages that discuss issues pertaining to that stage in the writing process. For example, Figure 1 shows how “Developing Your Ideas” covers “Using Others’ Ideas,” which then includes discussions of citations, paraphrasing, summarizing, and so on. The modules do provide great depth and range: “Editing and Polishing,” for instance, includes five subheadings and 31 individual topics. This organization clearly invites a student to follow a rather linear writing process alongside the program, perhaps turning a composition into a self-directed workshop, or perhaps assuming too much about the student’s writing practices, which may be more unique. The web site has therefore proposed an approach to writing that may be too rigid or ethnocentric for every student and context. Yet, many should still find the program useful as a reference tool as they focus on areas that concern them during a particular moment. For those who follow along with the program’s sequence, videos and reflection questions at the end of each module replace the teacher and test. The videos apply the lessons of the module or topic to model essays (or rather, chunks of material extracted from essays). For example, the topic of outlining is explored through a sample argumentative essay on air travel. This chance to see the concepts of the lesson being demonstrated though an example can be crucial for self-directed learners who, for instance, might not have an instructor to explain what an outline might look like and how it is used to structure an essay. It is important to note that this program offers no evaluation of the student’s writing; instead, the aim is to promote thoughtful writers who can benefit from a working knowledge of the expectations of academic discourse communities. For example, the reflection section may ask, “Which strategies [for editing and polishing your work] are you currently using?” “Which do you plan to use [in the future]?” The ESL-WOW does its part by providing instructions on how to use Microsoft Word’s grammar features and offering links to numerous commercial and free automated writing evaluation programs. In addition, the website’s section on “Editing and Polishing” includes video explanations and interactive quizzes on aspects such as identifying phrases vs. clauses, run-on sentences, fragments and punctuation. An additional tutorial covering plagiarism can be found at the bottom of the navigation pane. This tutorial was developed before the rest of the ESL-WOW, and features a different visual design and real-life actors. Its aim is to help students learn about the cultural norms that account for differing views towards plagiarism, and it includes tips on identifying and avoiding plagiarism. Obviously, this is directed towards future academic writers. As a general description, a colleague’s remark that the ESL-WOW is “an online version of a reference guide” is not too far off. The scope and sequence is similar, right down to the cursory look at common grammatical errors and the reliance on the argument essay as the model for Western-style, academic writing. Given these similarities, why not simply purchase a popular reference text like The Prentice Hall Reference Guide? The ESL-WOW was designed explicitly for English language learners to use when a teacher is not present (besides being free and more interactive than a book). There are countless online websites devoted to ESL writing, and plenty of academic reference texts written by experts in the field; the ESL-WOW combines the two in a novel way that suggests the curriculum will be more accessible to self-directed learners without sacrificing too much rigor and depth. The program’s decision to grant access to any user makes it an attractive tool for self-directed learners, especially those entering academic communities. 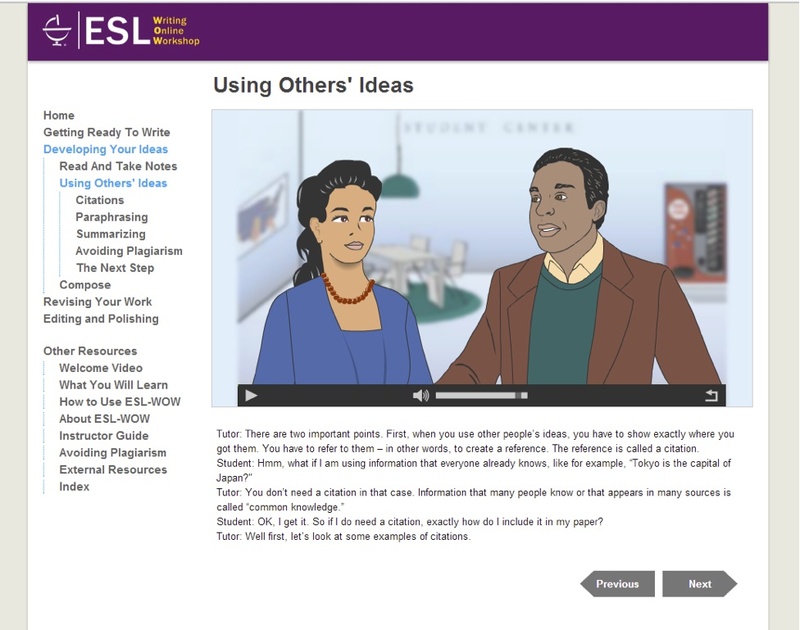 The best way to learn more is to visit the website at www.esl-wow.org and browse the program’s content. It may also be helpful to review the program’s objectives and a note from the developers describing what students will learn (links below). The website also includes a short instructor’s guide and notes on how to use the program. Thaddeus M. Niles teaches English composition and coordinates a summer English program at Skidmore College in Saratoga Springs, New York, USA. He also serves as the ESL Specialist for the school’s Writing Center, sparking his interest in understanding and teaching the rhetorical conventions of Western universities. Spack, R. (1997). The acquisition of academic literacy in a second language. Written Communication, 14(1), 3-62.